Atlas Cars of London has been established since 1965 and we specialize in a variety of passenger services that ensure customer satisfaction to thousands of passengers each year. Our objective is to guarantee punctual passenger services that lead to customer satisfaction. With our wide range of 400 vehicles, including saloon cars, hybrid cars, BMW, Mercedes E and S class and mini vans, we face no impediment in serving all airports of London with timely passenger services. We employ professional drivers that are fully licensed from the Public Carriage Office and get interviewed personally by the company directors. Further, they are vetted by the London police to ensure safety. With 50 years of experience, we are adept at planning ahead and ensuring that all services are right on schedule, without any delays. As an international traveler, we fully understand the rigorous demands of traveling and reaching your destination on time, and consequently we have a carefully devised dispatch mechanism that allows seamless drop and pick-up. Our diligence has led us to develop a loyal customer base that involves thousands of minicab jobs every year. 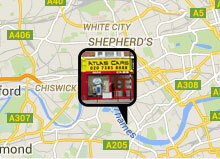 Get your minicab booked with Atlas cars to an on-time experience, by calling us at 0207 385 8888.